See examples of our custom jewelry work for some of the largest brand names in fashion. A great way as an organization to show how appreciative you are to employees or volunteers, is to present them with a Gold 'N' Things lapel pin or emblem. We offer a wide selection of base metals and finishes to provide you with the finished product you desire. If you require a custom made lapel pin it is not an issue. 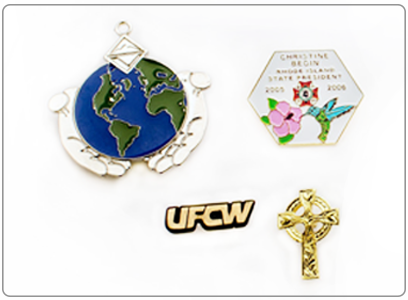 With the vast experience of our staff at Gold 'N' Things, we are able to produce any pin you request.